The Cathedral Church of All Saints is the bishop's church of the Episcopal Diocese of Milwaukee, in Milwaukee, Wisconsin, USA.The current parish is a descendant of a small mission by the Right Reverend Jackson Kemper. It is located in Milwaukee's downtown Yankee Hill neighborhood. 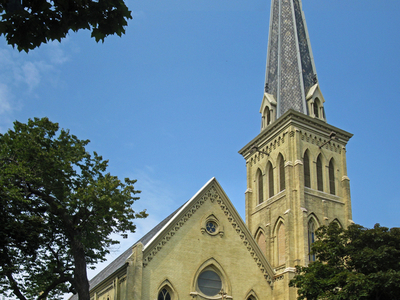 The Gothic Revival church building was designed by E. Townsend Mix, a noted Milwaukee architect, and constructed as Olivet Congregational Church in 1868. The building was sold to the Episcopal diocese in 1871 when the Olivet congregation faced bankruptcy, and was consecrated as a cathedral in 1898. Incense was first used at All Saints Cathedral on Epiphany, 1902. The cathedral complex, which includes the church, an attached guild hall and nearby bishop's manse, is listed on the National Register of Historic Places and was designated a Milwaukee City Landmark in 1973. The tower and steeple, approximately 200 feet tall, houses a bronze bell cast in Pittsburgh, Pennsylvania in 1867 one year before the church was built. Most of the stained glass windows in the cathedral were designed and produced in England, most by Lavers and Westlake of London. A large rondel window of Christ the King was made by Heaton, Butler, and Bayne, also of London.Today's church features a liturgy in the Anglo-Catholic tradition. The congregation is small, including only around 250 members. 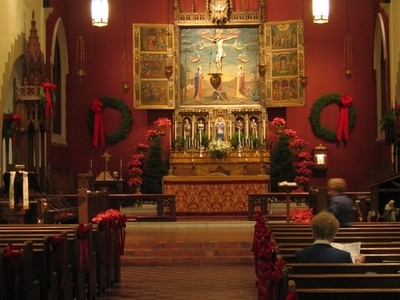 Here's the our members favorite photos of "Churches in Milwaukee". Upload your photo of Cathedral Church Of All Saints!